Tokyo, New York, Chicago, London – April 2, 2019 – Vela, a leading independent provider of trading and market access technology for global multi-asset electronic trading, announced today that its multi award-winning fully-hosted and managed Direct Market Access (DMA) Platform is now available in the Japan Exchange Group (JPX) site in the Tokyo region. With a tier 1 investment bank among one of the first major clients at this co-location space, this access further strengthens Vela’s presence in APAC and is part of its wider expansion plans in the region to enable clients to trade additional markets, locally and globally. By co-locating in cabinets with premier access to JPX markets, Vela is able to offer ultra-low latency order routing and market data to Osaka Exchange (OSE). With ASX already live on the platform, JPX is the next step in Vela’s global expansion with further points of presence planned in key APAC markets, including SGX and HKEX. The JPX co-located order routing and market data capabilities complements services already provided at key data centers in North America and Europe. 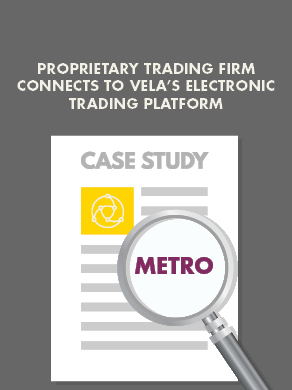 Vela’s award-winning DMA Platform offers normalized order entry, pre-trade risk, drop copy, full risk management and normalized market data, supported by a strong clearing member ecosystem. This high-performant and scalable platform provides ultra-low latency and fully-normalized access to all the major listed derivatives venues for buy-side and sell-side firms. In addition, the multi-asset DMA platform is supporting a growing number of global trading destinations in the Fixed Income markets. Japan Exchange Group, Inc. (JPX) was established via the business combination between Tokyo Stock Exchange Group and Osaka Securities Exchange on January 1, 2013. JPX operates financial instruments exchange markets to provide market users with reliable venues for trading listed securities and derivatives instruments. In addition to providing market infrastructure and market data, JPX also provides clearing and settlement services through a central counterparty and conducts trading oversight to maintain the integrity of the markets. In the course of working together as an exchange group to offer a comprehensive range of services, we continue to make every effort to ensure reliable markets and create greater convenience for all market users.